The Hampton Inn New York 43rd Street United Nations hotel is conveniently nestled in Midtown Manhattan*s nostalgic Turtle Bay which is just north of Tudor City. Enjoy a beautiful upscale area of Midtown Manhattan filled with historic attractions such as the Chrysler Building and Grand Central Station. Then when you*re in the mood to shop like crazy take a stroll down Fifth Avenue to embark on *shopping bliss* when visiting many of the most popular flagship stores in the world such as Saks Fifth Ave and FAO Schwartz. In the evening on your way to Times Square to take in the night life take a stroll through Bryant Park one of Manhattan*s most favorite parks. When you*re done taking all of what New York City has to offer unwind and relax in one of our cozy hotel rooms which feature a clean and fresh Hampton Bed. Stay productive and entertained while in your room which feature 32 inch LCD HD Flat Screen TVs as well as complimentary high speed Wi-Fi. After a great night*s sleep join us for a Hampton*s free hot breakfast and revive with fresh coffee fruit juices and our famous waffles. Even if you*re in a rush don*t miss the most important meal of the day. On your way out simply grab one of our free Hampton On the Run Breakfast Bags available /Monday Friday/ for a quick healthy meal to go. 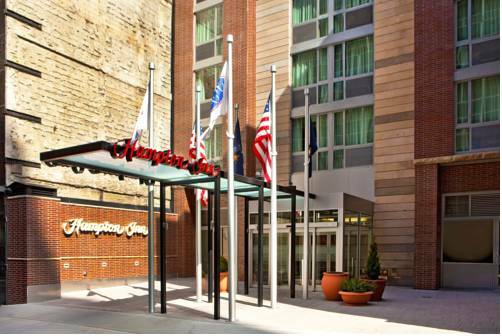 The Hampton Inn New York 43rd Street hotel is only a block away from Grand Central Station and conveniently located close to Penn Station and Port Authority. The hotel is just minutes from LaGuardia and convenient to John F Kennedy and Newark Liberty Airports. Compared to Peter Lugars steak house very high end steak house affair. Thin Crust Pizza Restaurant which serves crispy brick oven pizza at an affordable price. The Capital Grille. Known for delicious dry aged steaks chops and fresh seafood. An award-winning wine list. A relaxed elegant atmosphere. And to top it all off it*it*s in the Trylon Towers of the exquisite Chrysler Center.